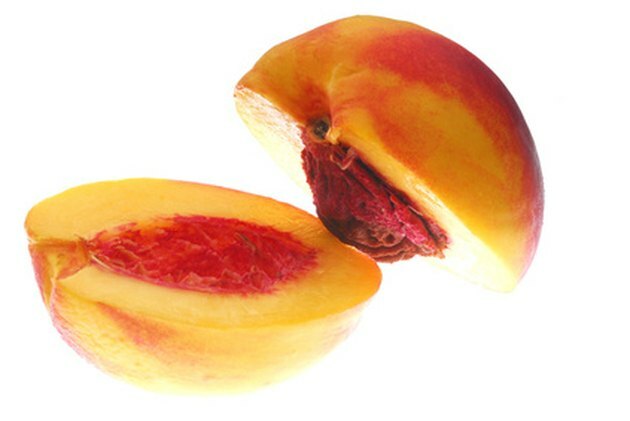 Although it may seem like the pit in a nectarine is a giant seed, it is actually a sort of pod that stores the real seeds. Instead of spending money on a baby nectarine tree from a local nursery, you can propagate your own tree using the pit from local fruit. This method is a bit more time-consuming, and your tree won't bear fruit for three to five years, but you will have the satisfaction of knowing that you grew your tree from seed. Nectarine seeds must sprout in cold temperatures. Save a pit from a nectarine. Ideally, you should use the pit from a nectarine grown by a local farmer so you can be sure the plant will survive in your climate. Rinse away any remaining fruit pulp, and let the pit dry out on a paper towel for a week. Place the pit on a hard, flat work surface, and hold it in place. Gently tap the pit with a hammer until it cracks open. Pull the pit apart, carefully remove the seeds, and set them aside. If necessary, tap the pit with a hammer again until you remove all the seeds. Place the seeds in a plastic food storage container, and store them in your refrigerator until you are ready to plant. Remove the seeds from cold storage in mid to late January, about four months before the last spring frost. Fill the container with room-temperature water, and allow the seeds to soak overnight. Fill the glass jar with soil, and plant the seeds about 1/2 inch deep. Carefully water the soil until it is just moist. Be careful not to overwater the seeds. Secure the lid to the top of the jar, and keep the jar in your refrigerator for about three months, checking the jar every other week to see if the the seeds have sprouted. Remove the jar from the refrigerator after the first three months, and remove the lid. Keep the jar in a warm, sunny spot, and water as necessary to keep the soil moist. After all danger of frost has passed, transplant the seedlings to a sunny spot in your garden.